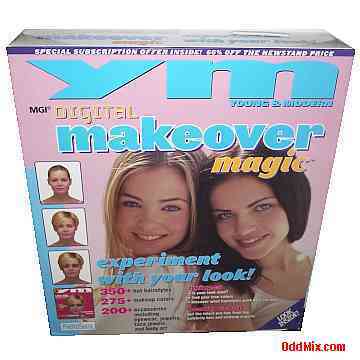 This YM Digital Makeover Magic Style Studio Windows Game Software Program allows to experiment with your look and it is a great entertainment activity. It has 350+ hair styles, 275+ makeup colors, 200+ accessories, including eyewear, jewelry, face jewels, and body art. This program works properly like lightning even in an early Windows 95/98 environment. Even on slow older computers the DOS and early Windows programs work very much faster. The game is unused on CD in a factory original box. First come first serve, only one available. • Size: 9.5 x 10.75 x 2.2 [in] approx.